The Patient Protection and Affordable Care Act (PPACA) has brought about the most significant change in healthcare since the passage of the 1965 legislation that authorized Medicare. Prerequisites are not necessary to participate in this course and no advance preparation is needed. Affordable Care Act (PPACA) is likely to affect virtually every person in the United States in some way. * Individuals with other professional credentials should check with their state licensing board or accrediting organization to determine if this program meets their continuing education requirements. Drake Software is an IRS-qualified sponsor of continuing professional education. 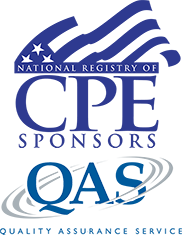 Drake Software is registered with the National Association of State Boards of Accountancy (NASBA) as a sponsor of continuing professional education on the National Registry of CPE Sponsors. State boards of accountancy have final authority on the acceptance of individual courses for CPE credit. Complaints regarding registered sponsors may be submitted to the National Registry of CPE Sponsors through its website, www.learningmarket.org. Drake Software has been approved by the California Tax Education Council to offer Affordable Care Act - Individual Rights & Responsibilities, 3038-CE-0180, which provides 2 hours of federal credit and 0 hours of state credit towards the annual continuing education requirement imposed by the State of California. A listing of additional requirements to register as a tax preparer may be obtained by contacting CTEC at P.O. Box 2890, Sacramento, CA 95812-2890, at (877) 850-2832, or at www.ctec.org. Drake Software is registered with the Texas State Board of Public Accountancy as a CPE sponsor. This registration does not constitute an endorsement by the Board as to the quality of our CPE program. Send cancellation requests to Support@DrakeCPE.com. Requests must be made within 30 days of purchasing the course. To be granted a full refund, you must not have completed and earned continuing education for the course. No refunds will be issued after the course expiration date. For more information regarding the refund policy or to address concerns or complaints regarding courses, contact the DrakeCPE support team at Support@DrakeCPE.com.